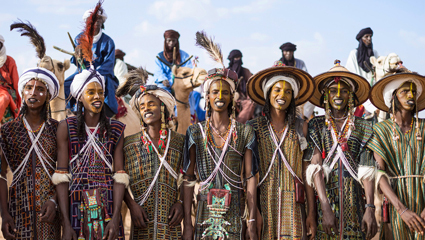 If you’ve ever flipped through a National Geographic and been fascinated by the images of the tall, lithe, beautiful men of Niger, their faces painted red, white and black, their eyes wild and wide, their teeth flashing an eerie grin, you’ve already been introduced to the Wodaabe, “people of the taboo.” This relatively small group of traditionally nomadic people is made up of subgroups of the Fulani and Tuareg people. The Wodaabe have been famously documented in their elaborate ceremonial costumes and face paint, which are all part of the annual male beauty pageant known as Gerewol. But Gerewol isn’t a singular event. Each year the Wodaabe people travel to the southern edge of the Sahara desert, gathering in various places for this ritual. The most famous location is In-Gall, a town known for its salt flats, and the location of the Cure Salee festival. During the Cure Salee festival in September, after the rainy season is over, this tiny town of 500 grows to upwards of 50,000. Nomads and their herds make the pilgrimage to this tiny town while tourists pack in to celebrate the annual gathering that serves as a harvest festival, a marketplace, a gathering of the tribes, and a spectacular display of peacocking in an effort to be deemed the most attractive of their clan. As part of the pageant, Wodaabe men paint their faces, usually red or yellow with white and black accents, which serve to highlight symmetry in the facial features, something that Wodaabe women value quite highly. The men sing and dance (known as Yaake) in an effort to impress the female judges, not only with their looks, but also with their stamina and dedication. The Yaake can last for hours each day, with the men dancing and singing in the hot desert sun. While the men perform, the women observe with discerning eyes, carefully selecting the most attractive man out of the line-up. Once a female spots the man she finds most attractive, she points to him; the clan with the most men selected “wins.” If a proposal results from the pageantry, the man will take a calabash filled with milk to the female’s parents. If they give their blessing for the marriage, the man will then pay the family for the bride—typically three cows—in a sort of reverse dowry.